Well for as long as I can remember. I have the most peculiar habit of needing a certain said item, so much so I go to the most extreme lengths to get hold of it. And if by some very unfortunate circumstance I cannot get hold of it, which does happen from time to time. It still remains etched in my mind. My first recollection of this is a Loop NYC boom box bag I got in a January sale, a good 6years ago. It was reduced to £10 in the House of Fraser, I purchased it in pink, but my Mum had bought me the same one in black, so we swapped and she returned the pink one, thinking black would be more versatile. Little than a week later I was regretting it. And I would often see people with this bag, and think is that the bag I gave up? Well this story has a happy ending. I finally tracked this bag down on eBay some years later and can safely say it is the bag I always wanted. Do I use it? No, but my fifteen year old self loved this bag. Will I ever part with it? As crazy and stupid as it sounds, probably not. Similarly I also retracked this Minnie Mouse H&M bag down after it had sold out in store. It was a children’s bag but that didn’t matter, nowadays it can be found hanging in my craft room stuffed with fabrics. So truth be told eBay can save the day. The same situation can also arise due to no fault of ones own. For example I was in a Charity shop some years ago. Browsing the front display of bric a brac, little did I know a pair of original floral Dr Martens in my size (not that would have deterred me) were sitting at the bottom of the shop. By the time I arrived towards the counter I saw a woman with them in her hand, looking very pleased with herself paying a mere £5.99 (I painfully watched and sulked for at least two weeks after). I could have DIED. And still to this day, believe this would have been one of my greatest finds. I may also add that any sort of charity shop, boot sale, thrifted experience can be a very competitive field. As more than likely only one item exists in that specific location and you are not the only person who may accidentally stumble across it. So be warned, get your claws out! No, you are not alone! I too have mad impulses where there is something that I must, just must have. It doesn't matter how long it takes to track it down , the desire doesn't go out of my mind until I have it. I must say that these things do tend to be linked to memories that they evoke, generally good memories of the past. One such example is bakelite egg cups. My aunty had these when I was young and the smell of the bakelite with a hot boiled egg perched in it stayed with me and was synonomous with her very homely house and happy times. I have now tracked down some of said bakelite egg cups, just the same as my aunties egg cups - and yes I do use them, they are cherished items that I will never part with. does that make sense? That pink bag is incredible and I always so go for the impractical item that you love rather than the boring "it'll go with anything" option. You're guaranteed to love it forever rather than regret a compromised decision. PS What size are you? 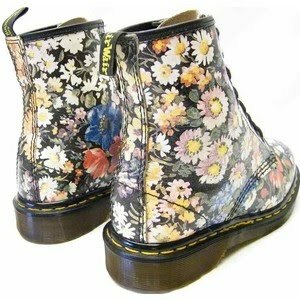 I have seen floral docs recently and if I see any again I'll definately get them for you if I know the right size. I remember you obsessing over that bag! And trust me, you're not the only one who does this! I'm still having wistful thoughts about the beaded waistcoat that I put back on the rail in the River Island sale earlier in the year. Why did I do that? Such a stupid mistake. I always do that. And I always think that my life would have been AMAZING with the thing that I just lost out on on ebay, and sulk about it for ages. Maybe I should go on ebay with less optimism for winning? .........Nah! You really are not alone! The Loop NYC bag is fabulous, and such a great story too! So glad you found it again, it's definitely something to keep forever! Loved this post! I have been known to seethe with anger after missing out on a bargain. I've been known to track down said 'bargain' on eBay and pay more than I wanted to, just so I could own it. i love that you managed to track 'em down! i bought a rodarte for target dress which was like $30 originall...cost me £60 to get it here.